For those who live in rental apartments or small homes that cannot accommodate a built-in dishwasher, a portable model is the next best thing -- and a great alternative to hand-washing. Portable units can take two forms: wheeled and countertop. Wheeled dishwashers are larger, usually 18 inches across, and roll around on caster wheels so you can store them in a pantry or closet when not in use -- assuming you have storage space. Countertop dishwashers are meant to be left on the counter, although many users keep theirs in storage and move it to the counter only when they need to use it. All portable dishwashers hook up to the faucet to run, so you can't use your spigot when the dishwasher is running. Also, since they manually install before each use, they tend to be more prone to unexpected leaks. That means it's best not to leave them unattended when they're running. We saw quite a few rueful comments from folks who came home to a nasty flood from the hose loosening at the faucet due to it not being properly tightened. Still, most people love their portable dishwashers because, even though they may not be as convenient as a built-in, they're still better than washing dishes by hand. For this update, we're changing our Best Reviewed pick to the SPT SD-9241SS (Est. $475) for its combination of good performance and attractive appearance. With a stainless and black exterior, most owners say they don't mind it sitting out in their kitchen -- even though they can roll it away into a closet if they want to.. It's well-featured, too, for a small dishwasher, with six wash cycles, a time delay feature, and a stainless-steel drum which helps keep the noise level down. The manufacturer, Supentown, says it can accommodate eight place settings, but that's highly variable. In a roundup at Reviewed, Matthew Zahnzinger heaps plenty of praise on the SPT SD-9241W, which is identical to the SPT SD-9241SS, but comes in white, naming it Best Overall, a Best Buy and giving it an Editors' Choice award. He says that it even performed better on some stains than full-sized dishwashers in their testing. It doesn't dry well, because there is no heated dry option, but we see that same complaint about high-end built-ins costing four times as much money. Ultimately, he says, "this is as good as portable dishwashers get." Owners also like the SPT SD-9241SS. Aside from a few durability complaints, again, something we see with all dishwashers, most say it's been a great time-saver for them, and does a great job washing dishes. Quite a few comment on how intuitive it is to use; they didn't even need to consult the owner's manual. Many say it's surprisingly quiet, too. If you can find it at a lower price, our former Best Reviewed pick, the Kenmore 14652 (Est. $750) is still a good choice. The only reason we dropped it to runner up status is that the price varies quite a bit. MSRP (which we use in all of our appliance reports) is $750, but it was on sale for $500 when we compiled this report. That's a great price for this dishwasher, but last year the MSRP was lower at $710 and he sale price was higher at $600, so we say buy the Kenmore only if it's the same price or lower than the SPT SD-9241SS. But on to why you might want to buy the Kenmore 14652. 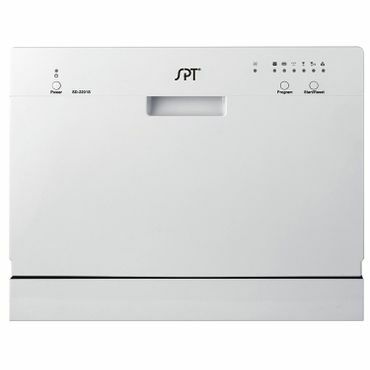 In the aforementioned roundup at Reviewed it, "comes in an incredibly close second," to the SPT SD-9241W, with excellent cleaning and debris filtration (which means less re-deposit, that nasty phenomena where debris from one dish lands on another). Like us, Zahnzinger drops it to runner up status based on price. A link there to a more comprehensive review by Johnny Yu at Reviewed reveals that, when it was tested in 2015, the Kenmore 14652 earned both Editors' Choice and Best of Year honors. Yu says this compact dishwasher is super easy to use and that it's a very good performer when it comes to cleaning. Owners agree, but note that it's much more effective if you're careful to not overload it. While Kenmore claims that this dishwasher accommodates up to eight place settings, Yu found that six was probably more accurate. The Kenmore 14652 comes with a nice array of features for such a small dishwasher, including six wash cycles and a delay start. Its 59 dBA noise rating is fairly high, but we see few complaints about noise -- although it will be louder than most built-in machines. The 14652 is white, but it also comes in black as the Kenmore 14659 (Est. $750). If you'd like an even less-expensive portable dishwasher, the Danby DDW1801MWP (Est. $430) is worth a look. It's third in Reviewed's roundup, with Zahnzinger saying that, "The overall cleaning performance was very strong, although dishes on the top rack had some issues." He also dings it a bit for its less-than-intuitive interface. That's not something we saw echoed in owner reviews, though, most are very happy with this little dishwasher, and quite a few wish they hadn't waited so long to take the plunge. Like the SPT and Kenmore, the Danby DDW1801MWP has a claimed eight-place setting capacity, six wash cycles and a stainless steel interior. For the price, unless you need a heavy-duty dishwasher to blast away baked-on cheese, this is a great value and definitely a step up from having to hand wash a sink full of dishes. Even the tiniest kitchen will usually accommodate a countertop dishwasher, and the top choice according to experts and users is the SPT SD-2201S (Est. $240). Professionals don't review many portable dishwashers, but the Sunpentown SD-2201W earns a positive write up and a Best of Year award from Reviewed. Keith Barry writes that "The Sunpentown SD-2201W holds its own when compared to full-size dishwashers." It also receives strong user ratings at numerous retail sites. The Sunpentown SD-2201S can't keep up with built-in dishwashers, or even most roll-away dishwashers, when it comes to capacity; it's rated to hold six place settings, but Barry reports that four full place settings is more realistic. However, it fully measures up to mid-priced built-ins in many other regards. Performance is excellent, with five cycles for dishwashing tasks from a light rinse to cleaning heavily soiled bakeware. All perform well, though not always perfectly -- cleaning items in the far rear corners of the SD-2201S were a challenge in Reviewed's tests. With a noise rating of 55 dB, it's louder than the top built-ins, but quieter than many cheap dishwashers, and quieter than many portable models, too. Installation is easy, reviews say, though you'll need to be within reach of a sink for the intake and drain hoses, which attach to your faucet via an included faucet adapter and Quick Connect coupler. Efficiency is excellent, and the SD-2201S is Energy Star certified. The Sunpentown SD-2201S comes in silver, but can be ordered in white as the Sunpentown SD-2201W (Est. $250). A step-up version adds a delayed start feature but is otherwise similar. It's sold in white as the Sunpentown SD-2202W (Est. $300) and silver as the Sunpentown SD-2202S (Est. $270). However, we don't recommend leaving a countertop or portable dishwasher running unattended. Also, these prices vary quite a bit, so buy the one that's the least expensive the day you go shopping -- there's not much difference between them.